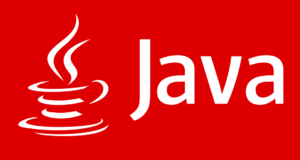 Two Dimensional Array in Java Programming – In this article, we will explain all the various methods used to explain the two-dimensional array in Java programming with sample program & Suitable examples. A two-dimensional entity, in general, is something that has two specific parameters. Those two parameters are usually length and breadth since it is a physical quantity. Similarly, a two-dimensional array is an array which technically has one row of elements, however, each row has a bunch of elements defined by itself. Basically, you need to define both the rows and columns and then go ahead with declaring the elements in the respective locations or indexes. As you can see in the example given above, firstly, you need to specify the number of rows that you are assigning with the array. In this case, it is 2. Next, you need to mention the number of columns that you want to assign with the array. Thus, there will be a total of 6 elements that can go into a 2×3 Matrix. Hence, the elements are arranged accordingly and you will get your two-dimensional array. 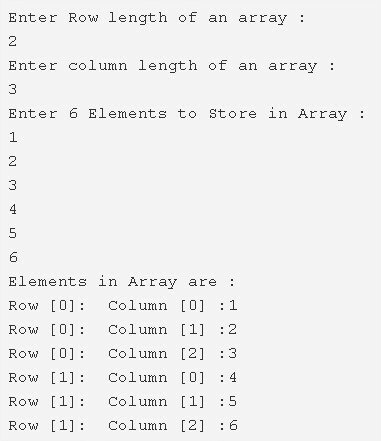 In two dimensional array represent as rows and columns. 2) To print the two-dimensional array, for loop iterates from o to i<3 for loop iterates from j=0 to j<2 print the element which is at the index a[i][j]. Read the row length, column length of an array using sc.nextInt() method of Scanner class. 2) Declare the array with the dimension row, column. 3) for i=0 to i<row for j=0 to j<column sc.nextInt() reads the entered number and insert the element at a[i][j]. To print the elements of two-dimensional string array for i=0 to i<3 for j=0 to j<2 prints the string element which is at the index str[i][j].